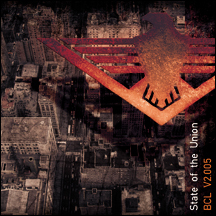 Black City Lights V2.0 is the remastered and reworked version of State of the Union's debut album, Black City Lights. State of the Union mastermind Johann Sebastian has completely dismantled the original versions of each track and then manipulated, tweaked and reconfigured them to come up with a more defined sound. Check out the new versions of the club hits Black City Lights, Citizen and Firewall.